Looking to treat yourself? Why not, you deserve it! 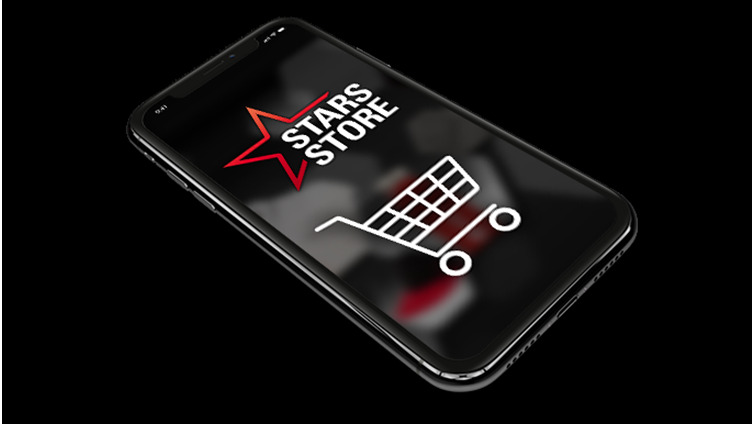 Stars Store and the Rewards Store offer everything from clothing and accessories to online rewards you can use to enhance your experience on all our great products. Whether you’re celebrating a winning moment or looking to find the perfect gift, Stars Store is the perfect destination. Click below to browse a wide selection of items including luxury goods, poker products and exclusive branded clothing and accessories. 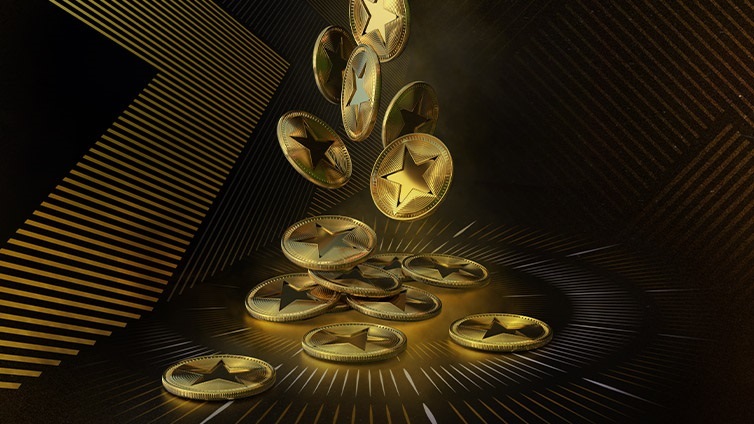 Collect StarsCoin as a Stars Rewards member and redeem it here for a variety of online rewards to enhance your gameplay experience. Online tickets and more are available now – use your StarsCoin to get more play, more value and more fun! Click below, or find the Rewards Store in the app and our desktop software via the ‘My Stars’ menu. Can’t find what you’re looking for? Try the Help Center or contact Support. How do I order from the Rewards Store? Log in to your Stars Account. Click on the ‘Rewards Store’ button. Confirm or update your telephone number. Please Note: If this is your first order, you will need to provide your telephone number in the spaces indicated (including the country code) before the order can be completed. Read the disclaimer. If you disagree with the information stated you can decide to cancel this order by clicking on ‘Cancel’. If you wish to proceed, please click on ‘I agree to the above stated terms’. The Purchase Confirmation popup box will appear, click ‘Confirm’. At this stage, and before you confirm the order, you can decide to go back and update the colour, quantity, and your address and phone number. You can also cancel your order. An automated email will be sent to you with your order confirmation. Please check that everything is correct. Please Note that not all items are available in some countries, and that depending on your country of residence, certain duties and taxes may be payable to the relevant authorities in order for you to receive goods which you have ordered. Additionally, you may be required to provide certain documentation before such goods will be released to you. You are fully responsible for paying any fees and/or providing any documentation as may be required by the relevant authorities in your country of residence. Failure to do so is at your own risk and no StarsCoin will be reimbursed to you as a result of your non-compliance with any requirement within your country of residence for the release of your goods. Can I order from the web or by using my phone or tablet? I have just placed an order, when will it be processed and shipped? Orders can be processed as early as three hours after being placed. Timeframes for order processing will depend on the item and day you are ordering. Some items, such as Security Tokens, are processed on a weekly basis. Please note that when ordering during the weekend, your orders will be processed on Monday/Tuesday. What is the time frame for delivery? If you do not receive your order within the specified time frame, please contact Support. Otherwise, your package is assumed to have been delivered. If I want the order to arrive sooner, can I pay extra? No. We do not offer express service, and we cannot make exceptions. All orders are delivered in the same timeframe. If I did not receive my order, but forgot to let you know after the timeframe stated for my region has expired, what happens? Unfortunately, orders older than 6 weeks (from the date the order was placed) cannot be credited back unless they have been returned to us. This is why it is very important for you to contact us straight after the expiration of the delivery timeframe for your region if you haven’t received, so that we may track it and investigate the delay. Why do I need to provide my personal tax number? This is a requirement from your local authorities to allow for the courier parcel to be delivered. This information sits with the order and is not to be used for any purpose other than the shipping of your order, in conformity with the data protection laws. Can Items from the Rewards Store be purchased using real money? No. However, items in Stars Store may be purchased for real money. Can I have my order shipped somewhere other than my home address? If you wish to have an order sent to an alternate address, you may order the item as normal, but during the order process there will be an option to send the item to an alternate address ('Use Different Address'). Please DO NOT change the address on your account. It is important to provide an address where someone will be available to receive the package. Please note that some shipping restrictions may apply for certain countries and, as a result, you may not be able to get some items delivered to another country. Do I have to pay any shipping/taxes? Once you place an order, there are no further costs you will need to pay as shipping and taxes are included in the cost. However, depending on your country of residence, certain duties and taxes may be payable to the relevant authorities in order for you to receive goods which you have ordered. Additionally, you may be required to provide certain documentation before such goods will be released to you. In the unlikely event of a customs request for payment, please note that we will reimburse your account once we receive a copy of the commercial invoice included in the parcel, the paid receipt (clearly showing the amount), and proof that the delivery was from us by means of our Shipping Invoice (Pick Note). Simply contact Support and we will gladly assist you. What size are the clothing/caps/bags? Check item descriptions for a sizing chart. Please be sure to check the measurements carefully as our sizes vary in fit. You must contact Support to have your return approved as there are certain procedures and restrictions. If you order the wrong size, you can return the item; however you will need to pay for the shipping costs. You should always check our sizing charts to make sure the item will fit properly. Should you receive a different item than the one you have ordered, you may be required to send it back to us at our cost; the correct product will be shipped to you free of charge. Kindly contact Support and we will gladly assist you. Please keep in mind that if an item is returned to us without the original order number included in the package and/or without authorization, we will not be able to credit back StarsCoin or send a replacement. Can items be shipped to a P.O. Box address? Orders cannot be sent to a P.O. Box address as someone must be available to receive the package. Log in to your Stars Account via the desktop client (order history is not currently available via the mobile client). Click on the ‘Rewards Store’ button. A pop up window will open. Click on the top tab on the left, and a pop-up window with the tab ‘Order History’ will appear. Clicking that will bring up a pop up window with all the orders ever made. I ordered items at the same time, but they did not come together. Why? Some items are shipped from different locations and will arrive separately. Can I alter or cancel my order after I place it? Yes. As long as the status of the order is 'New' you can go ahead and cancel it through the desktop Cashier. If you need to alter your order, you will first need to cancel the order and place a new order. Once your order is placed, you will be sent full details via an order confirmation email. Please check any details carefully. Then the order is processed for packing and shipping. Orders are processed on a daily to weekly basis, depending on the item. Please note that orders can be processed as early as three hours after being placed. Once an order is processed, it can no longer be cancelled or altered. I requested a change in my order, but it was not changed. What happened? Unless you receive a reply to your order change request, we cannot guarantee this change or cancellation has been made. I received a damaged product, what should I do? Once we receive all the required information, we will proceed accordingly. Depending on the item, you may be requested to send it back to us. Can I return/exchange my item in person? The Fulfilment Centre will not accept any walk in returns/exchanges. You must mail your order to the return address provided to you by the Rewards Store Customer representative. Once the product arrives in its original condition, a new one will be sent out to you or the StarsCoin will be credited in your Stars Account, depending on the arrangement made. Please do not call the warehouses directly; no information will be given out nor can you buy any items from the Fulfilment Centre. All inquiries must be directed to Support. I ordered merchandise from the store and the status of my order is still processed and not mailed. Why? Not all of our distribution centers use the same method for dispatching orders. If you do not see your order status as mailed, it does not mean that it has not been shipped. For further inquiries regarding your order please contact Support. What happens if nobody is available to accept the package upon delivery? If your order is shipped via Regular Mail, the delivery will be made by the local Postal services in your area. The methods and timeframes for delivery vary from country to country, but usually they will make up to two delivery attempts before leaving a card and holding your parcel at the local postal office. The card will state the date and time they tried to deliver the parcel, the address and business hours of the postal office where your parcel is being held, the date it will be available for pick-up and sometimes a reference code. In some occasions a redelivery can still be arranged with them or, if this is not possible, you will have to pick up the parcel at the designated postal office. Usually they will hold the parcel for up to two weeks after which the parcel will be returned to the Rewards Store or disposed of. If your order is shipped via courier (for example FedEx), a tracking code will be emailed to you and you will be able to track it online using the courier´s website. The delivery will be entirely organized by the courier. The courier will usually make two or three delivery attempts, and after each one a card is left with the date and time they tried to deliver the parcel, a tracking code, address and telephone number for their local office and sometimes a date when they will return for redelivery. If the courier´s repeated delivery attempts are unsuccessful, they will eventually request that you collect the parcel from their local office, or that you contact them in order to arrange a convenient date and time for delivery. Usually they will hold the parcel for up to two weeks and, if not collected nor delivered and contact cannot be made with you;, the parcel will be returned to the Rewards Store or disposed of. Do you operate an ethical responsibility policy? Yes. As we are a global leader in the online gaming industry, we strive to maintain this privileged position in all that we do as a business. Accordingly, we ensure that our branded products are manufactured in a responsible manner and to high ethical standards. We strive to ensure that any third party that we engage with to produce our branded products is committed to and abides by the same exacting ethical standards that we maintain. We incorporate an ethical standards undertaking (“ESU”) within our commercial agreements with our third party manufacturers which is compatible with internationally recognized standards and the ESU addresses a spectrum of ethical sourcing issues designed to ensure that those involved in the production of our branded products are treated fairly and with respect, are paid in line with applicable jurisdictional requirements and operate in an environment that embraces their cultural, ethnic and philosophical differences. A core element of ESU is to ensure that employees meet minimum legal age requirements and we explicitly prohibit the use of underage workers and/or forced labor of any kind, including prison labor, indentured servitude/trafficking or for the restriction of free movement. The ESU also requires that acceptable standards for workplace health and safety practices are maintained, that the workers are paid regular wages and overtime, that there are restrictions on working hours and that the workers are provided with acceptable working conditions and within a safe environment. Finally, under our ESU, we maintain a right to carry out periodic, unannounced inspections of the factories used by our manufacturers to verify and document their adherence to our ESU and we will act swiftly to ensure that our third party manufacturers immediately rectify and fully address any shortcomings we identify from our inspections.